I love playing Bards. I really do. They are, by far, my favorite character class to play. Maybe it has something to do with the fact that I was in band for years in school, even being section leader in Marching Band my senior year of high school (obviously, I peaked early :P ). 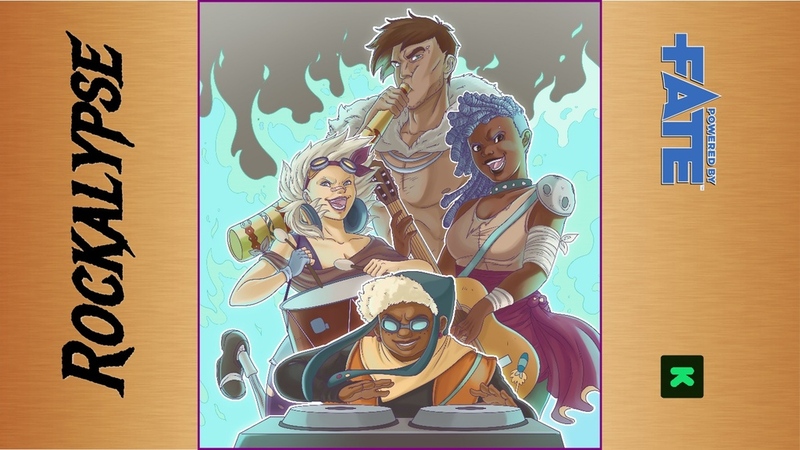 Well, what if, instead of a high-fantasy world, you had an entire post-apocalyptic RPG based around musical conflict? Well, then you'd have Rockalypse, which is billed as, "Scott Pilgrim meets Mad Max, Tank Girl meets Jem, Beat Street meets Buckaroo Banzai, plus FLCL, Brutal Legend, Six-String Samurai, and more." They've got my attention. They're also up on Kickstarter. Rockalypse is a post-apocalyptic RPG with a difference. Sure, you can set your game in the wasteland of a blasted-out desert, in the streets fighting against megacorporations, against invading aliens, or with Hell invading Earth. Or you can mix those together. Whatever you want. But where Rockalypse switches things up is in combat. Instead of lasers or bullets or whatever, you'll attack your opponents with Melody, Harmony, Rhythm, and Rhyme. That's my type of game. The Kickstarter campaign is up and running now. They're about 1/3 of the way to their goal with still 29 days left to go.